On Jan. 1, my daughter Gabi and I flew to Bangkok. This was after 18 days of traveling together in Asia. She was heading home. Meanwhile, I planned to stay in Thailand’s capitol city and deal with my fear of traveling solo. As we waited for her flight, Gabi watched me fidget on my iPhone. “Why are your hands shaking?” she asked. For me, traveling alone on business is easy. So is seeing a movie by myself, or restaurant dining for one. But when it comes to solo vacations, especially abroad — forget about it. Special trips need someone special, like a buddy, a lover or most recently, my daughter. Unfortunately, relying on others meant I rarely went anywhere! My issues actually went beyond waiting for the perfect travel companion. The fear of traveling solo was really about my childhood terror of being alone. It’s an issue I’m still working through, as you know from my life journey blog posts. But getting brave in Bangkok set me free. I learned to calm my default urge to panic. My inner traveler started enjoying new situations. Embrace the adventure, right? So over the course of two days, I hit shiny Buddhist temples, cute shopping destinations, historic sites and a ferry ride. 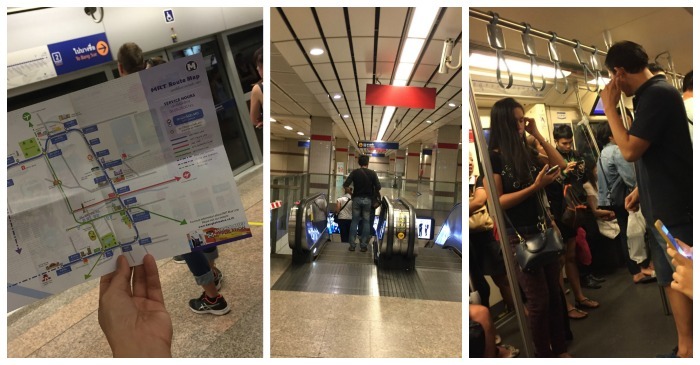 I learned to take the train and even read a map for the MRT, which stands for Mass Rapid Transit. It’s so clean and safe, that I even rode it at night. 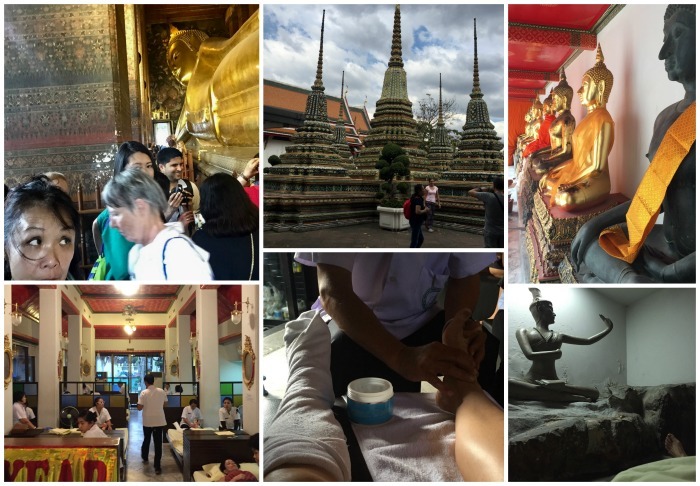 Once I discovered Thai massage, I bonded with Bangkok, literally feeling the culture through my body. My go-to place was Wat Pho, the Temple of the Reclining Buddha, a statue that’s longer than a football field. At the temple’s famous Thai massage school, I paid $25 (!) for a two-hour session that went marvelously deep (a one-hour foot massage + another hour of body work). I had less-than-beautiful moments, too. A taxi driver ripped me off to the tune of $5. Once, I boarded a rusty bus for local residents that luckily took me to where I needed to go. The first night, being out past sunset scared me so much that I bought microwave fried rice dinners and ate them in my Airbnb condo. And of course, going solo can get lonely. But I’d prefer that option to being on the road with a grouch or a needy loved one. Managing my fear of traveling solo opens up the world to me now. Whether I’m single or in a relationship, I’m looking at vacations differently. No more putting my life on hold. 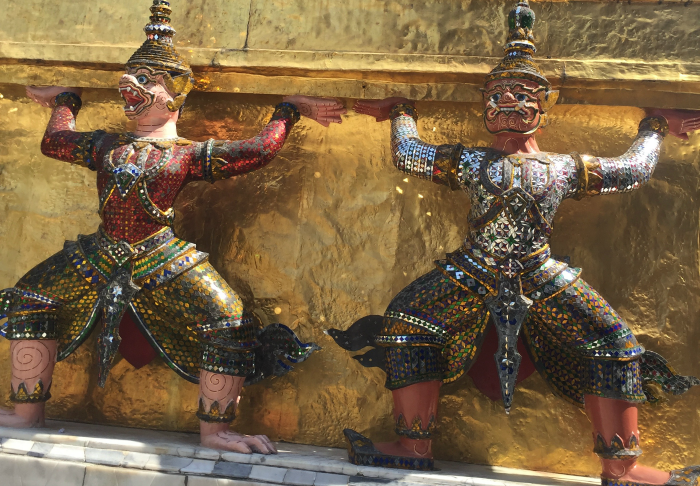 Bangkok was an ideal place to start dealing with the fear of traveling solo. As a top tourist destination, Thai folks are used to interacting with foreigners, which put my anxiety and fussing in perspective. After all, this is a city with not just McDonalds, KFC and Starbucks. Bangkok is home to 7-11, Au Bon Pain and even Dean and DeLuca, for crying out loud. It’s a new year. Time to start thinking about how we’ll treat ourselves good in 2017. Traveling alone can be a two-day affair, and somewhere close. Or, maybe something bigger, or far away. I hope sharing what I’ve learned can help jump start your solo travels, too. 1. Minimal planning is okay. I really don’t enjoy organizing vacations. Once I realized that, I booked the flight to Bangkok on impulse and worried about the details later. 2. One good travel guide is enough. Lonely Planet’s “Pocket Bangkok” was easy to carry around. Its small size kept me from getting overwhelmed. 3. I can survive without language skills. It helped to be in a tourist hot spot. Many locals spoke at least a little English. When they didn’t, we used hand gestures. 4. A place with mass rapid transit (MRT) is a plus. Public transportation was fast, cheap and helpful in navigating stations stops with names like Wat Worachanyawas. 5. Keep real friends close on social media. Posting pictures on Instagram and Facebooking meant there was always someone around to talk to. 6. Get advice from friends who’ve been there. When I asked for Bangkok tips on Facebook, my friend John kept me company the entire trip! 7. Consider a specific theme or interest. Exploring Thai massage gave me a focus and anchor. I structured my time around hitting a massage room every day. 8. Bring paper copies of flight & lodging info. Taking full charge of my trip meant relying completely on myself. Having documents on the iPhone wasn’t enough. What if the battery died? I also carried around my Airbnb address in both Thai and English. 9. Wear a real watch. I wish I had one with me, instead of constantly pulling out my iPhone just to check the time. This is another simple way to keep track of myself and my belongings. This is a fear that I have to overcome. I always travel with friends or family but need to go solo! Thanks for the tips! 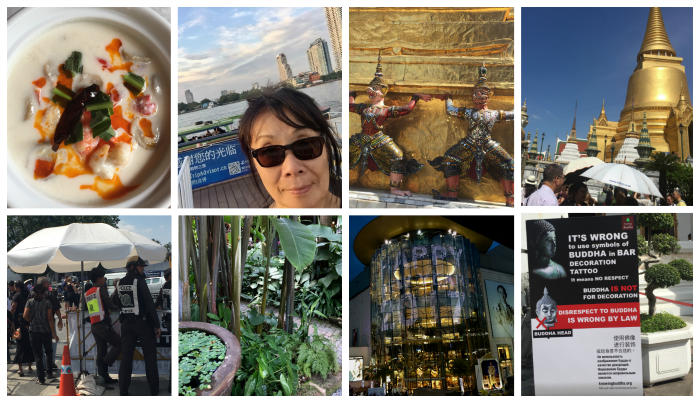 So glad that you visited Bangkok… where’s your next adventure? This was kind of a universal message to me today. Just “just this morning”!!! I looked at a website for a travel club. Last week, I planned out 4 vacations and small places to visit. I am in the same predicament as most. No one to travel with a. Need relatives who want to tag-a-long b. fear of flying c. and fear of what’s on the other side. I’m doing it this year. My first trip is a train ride next week to the Hudson valley alone. I am nervous thinking about it. I have been going to only one place for 3-year for 3 times a year. I can’t anymore. To visit my sister in South Carolina. I want to branch out even if it’s alone. 1. New Orleans, Canada, Florida and one out of the country trip that’s less than 7 hours by plane and some small day trips. I am tired of fear and depriving myself in general . Everyone keeps saying you shouldn’t go by yourself. They love to give advice. You have given me the courage to just go. I will keep you posted. If you could travel out of the country alone I could certainly do it for starters in the states. 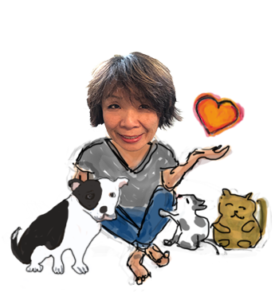 Thank you Betty Ming!! I also learned to travel solo on my trip around the world. It was lonely in places, and toward the end, I definitely had days where i just stayed in the hotel smoking cigarettes. Me, asthmatic and smoking. Helloooo?! lol. I should have been out in search of affordable 2-hour massages. I’ve loved following along on this journey — my mouth has watered at every nibble and bite you’ve posted. Laura, love that image of you smoking in your hotel room. I totally relate. The fear paralyzed me in Bangkok — and hit me a few times on my next stop, Taiwan. That’s where I am now. Thanks for sharing in my journey. You’re one of the reasons that I was less lonely!